The study which describes their findings recently appeared in the scientific journal Nature Astronomy. 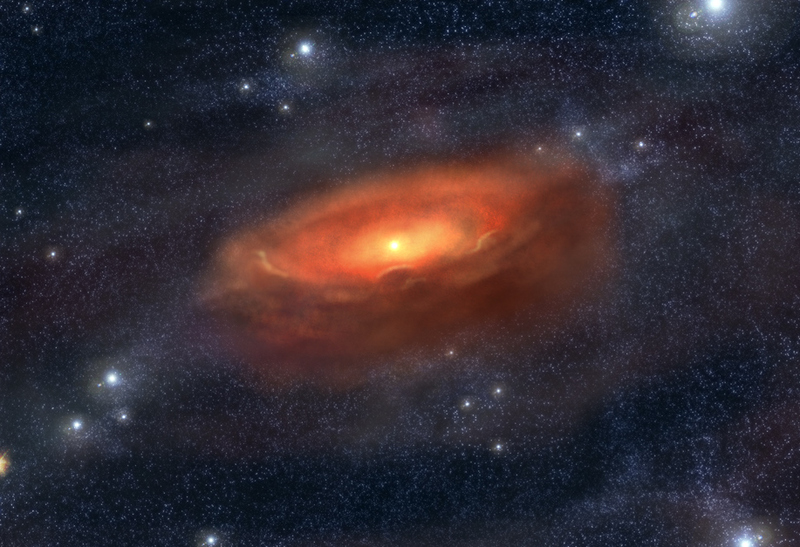 As they indicate in their study, the team used ALMA data to discern the presence of complex organic molecules (COMs) around V883 Ori – a young star located about 1300 light-years away from the Earth that is surrounded by a protoplanetary disk. False-color image of V883 Ori taken with ALMA. The distribution of dust is shown in orange and the distribution of methanol, an organic molecule, is shown in blue. - Image Credit: ALMA (ESO/NAOJ/NRAO), Lee et al. These observations were made possible thanks to a sudden increase in the star’s luminosity, which was due to a bursting torrent of material flowing from the disk to the star (what is known as a FU Orionis type outburst). This outburst heated the protoplanetary disk and caused icy particles to melt, as well as pushing the boundary of the star’s “Frost Line” out considerably. A Frost Line (aka. “Snow Line”) is the region around a star where temperatures become low enough that volatile elements (water, carbon dioxide, methane, ammonia, etc.) will sublimate to form ice. Around normal young stars, the radii of Frost Lines are about a few astronomical units (AU), but can enlarge by a factor of almost 10 around bursting stars. When V883 Ori experienced its outburst, it caused icy particles in the system’s protoplanetary disk to sublimate and trigger the release of COMs. These included methanol (CH3OH), acetone (CH3COCH3), acetaldehyde (CH3CHO), methyl formate (CH3OCHO), and acetonitrile (CH3CN) – molecules which, as with other COMs, could be related to the formation of life in planetary systems. The flare-up of the star, along with ALMA’s sensitive imaging capabilities, also allowed the research team to obtain the spatial distribution of the observed COMs. Based on their analysis, the team concluded that the molecules they detected had a ring-like structure with a radius of about 60 AUs around V883 Ori. What was especially interesting is the fact that the chemical composition of V883 Ori’s disk is similar to that of comets in the modern Solar System. Comets are the focus of considerable research attention since they are believed to have played a role in the spread of water and organic molecules during the early days of the Solar System. These comets are thought to have formed in the outer reaches of the Solar System (the modern-day Oort Cloud) where organic molecules were contained in ice. Because of this, research into the chemical compositions of protoplanetary disks is directly related to research into the composition of comets and the origins of life of Earth. Opportunities to observe outbursts are rather rare, since they last for only 100 years or so. However, young stars with a wide range of ages have been known to experience FU Ori bursts, so astronomers expect to be able to witness more of these events in the future – and in the process, determine the chemical compositions of more protoplanetary disks. This research will not only improve our understanding of the chemical composition of ices that evolves around young stars. It will also improve our understanding of how organic molecules evolved between the birth of our Solar System and today, which will reveal many things about the origins of life itself!